A quick guide to assist you in what will hopefully be a successful and happy harvest for all our clients! Few things make us at Vinlab happier than getting your results to you in a timeous manner. It would make us even happier to present results to you that would enable you to make the best wine possible. As you rely on your juice chemistry results for a more complete picture; below is a brief list of analyses that we offer and its effect on the final product that will be beneficial to you in making crucial decisions in this busy time. 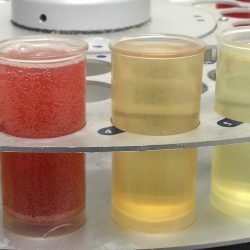 When planning to use the sugar content to predict the potential alcohol, it is important to note balling is not a true measure of the fermentable sugars. As balling is a measure of soluble solids in the juice or must, it includes not only the fermentable sugars, but the organic acids as well. Glucose + fructose, however, being the two main fermentable sugars by yeast provide a more accurate basis for predicting the potential alcohol. Unsure of how to use Glucose+fructose to predict potential alcohol? Effective fermentation management starts with a comprehensive knowledge of the nitrogen status of your juice. Nitrogen, being an essential macronutrient for yeast, ensures healthy activity and growth aiding in a successful fermentation. Both alpha amino acids (NOPA), a measurement of primary amino acids usable by yeast; and ammonia, yeasts preferred source of nitrogen; make up yeast assimilable nitrogen (YAN). Worried about a nutrient deficient juice? The addition of diammonium phosphate (DAP) either at the start or during fermentation should supplement this deficiency and prevent the risk of either a stuck/sluggish fermentation or the production of unwanted reductive aromas in the wine. Remember, prevention is better than cure! Ensuring sufficient nitrogen nutrients are available at this stage of the fermentation can assist you in the long run! pH is important not only due to its contribution to the perception of acidity on the palate but influences the intensity of wine colour, as well as, the stability of the wine, microbiologically and with regards to potassium bitartrate (cold stability) and calcium. The titratable acidity in wine, not the amount of total acids present, is the most widely used measurement of acidity in wine. It measures not only the free hydrogen ions, but also the undissociated hydrogen ions from acids that can be titrated with a base (sodium hydroxide) and is a reflection of complex interactions between hydrogen ions, organic acids, organic acid-salts and the cations in solution. Furthermore, TA levels in juice are vital when making acid adjustments, compensating for later loses due to MLF. Malic acid, the second most important acid in grapes, effects both the pH and the titratable acidity of the juice. During malolactic fermentation, malic acid is converted to lactic acid ultimately effecting the pH due to the loss of an acid group. The effect of this acid reduction on the pH depends on the initial malic acid concentration present in the juice. Although tartaric acid is one of the major organic acids in grapes, it is not necessarily the best acid to use as reference when deciding on acid adjustments. When analysing for tartaric acid, the result is a sum of all tartrate forms present in the juice, including the bitartrate form bound to potassium. Tartaric acid results can, therefore, be significantly higher than TA results. Turbidity, a measure of the degree of solids present in the juice, is a useful parameter particularly in white wine fermentations. Juice that is too clean is likely to be deficient in yeast nutrients, which could lead to stuck/sluggish fermentations. However, juices that are too turbid can result in the formation of H2S and subsequent stuck/sluggish fermentations. For cleaner, more aromatic, fruit driven wines ntu values of 80-120 are recommended. Complex wines with a greater mouthfeel and body ntu values of 160-200 are recommended. To achieve these desired levels, lees can be added back to cleaner juices. Wild yeast strains and heterofermentative bacteria (certain strains of Lactobacillus spp.) can contribute to the production of volatile acidity throughout the winemaking process, this includes prior to and in the early stages of fermentation. In red wines, VA levels are often elevated during the cold soak process or between the cold soak process and fermentation. VA levels have been known to increase as spoilage microorganisms are capable of growth until the fermentation conditions are able to inhibit their growth. This VA production not only affects the sensory attributes of the wine, but impacts fermentation efficacy. Wild yeasts coming in on grapes quickly deplete YAN in the must. To prevent stuck/sluggish fermentations, YAN levels should be measured before inoculation enabling nitrogen nutrient additions to take place before any problems occur. Lactic acid bacteria present in the juice phase pose a risk to increasing VA levels in stuck/sluggish fermentations. Increased monitoring of malic acid levels and microbe populations aid in monitoring these difficult fermentations. Early detection of these spoilage microorganisms can effortlessly be done by submitting samples for Vinlab’s Scorpion Bacteria detection assay! Measuring phenolics throughout the winemaking process aids the winemaker in not only making decisions in the vineyard and understanding the grapes but is a useful tool in managing fermentations. Phenolic content of the grapes links directly to the eventual wine flavour, colour and aging characteristics of the wine. Throughout fermentation and maceration phenolic compounds are extracted from grapes and released into the wine. Therefore, the strategy followed, and winemaking conditions present during fermentation result in a young wine with a particular phenolic content and composition. Winemakers can enhance various winemaking practices such as cold maceration, tannin and enzyme additions, punch down or pump-over regimes, fermentation temperatures, press timings and micro-oxygenation in order to achieve the desired phenolic extraction from the berry. •	FREE sample pick up from Stellenbosch, Paarl, Wellington, Franschhoek, Robertson, Worcester, Hermanus and Elgin! •	Results available ONLINE in real time, as well as, monthly invoices and statements! •	Samples can be submitted online using the Vinlab app. Smoke taint? Botrytis infected grapes? New blog post filled with handy tips coming SOON!